As my sister, Nancy, drove me twenty six miles to Orange Memorial Hospital, I remained unconscious. Her boyfriend, Billy, kept reassuring Nancy that all would be well, and Beverly held my head on her lap as I laid motionless. When I first opened my eyes in the emergency room, the lights above me glared annoyingly bright, and bared no resemblance to the Light that The Source introduced me to earlier that day. My sister’s eyes, that always sparkled, bore the look of deep concern and distress. Each tear signal her need to be comforted, but at that point I did not realize I was incapable of extending my arms to hug her. I laid there clueless of my condition, but the words that followed puzzled my sister. Calmly, I opened my mouth saying. 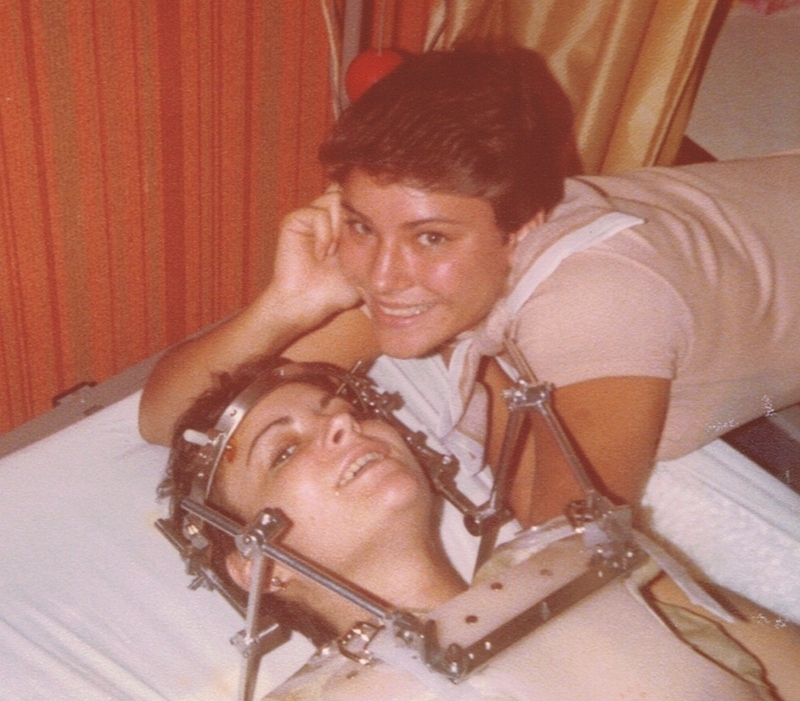 I had no knowledge that I broke my neck, nor that I was paralyzed. In my unconscious state the discussion of the doctors and their diagnoses must have filtered into my mind. Quickly, my body returned me to the safest place for me at this time ~ an inner protective space. My father finally arrived, only to be devastated by the news, that my fifth and sixth cervical vertebrae had been crushed. At this time I could breathe on my own, but my arms and legs looked lifeless. My mother, visiting family up north, shared with us later, that at 4:30 pm her ears began to ring, and she knew something dreadful had happened. Each day my awareness grew, and I communicated more. At first my family and friends entered my room with a solemn demeanor, unaware of how I would respond emotionally. Expecting a fragmented spirit, their intentions were to uplift and assure me that all would be well. But, by the time they reached my bedside, the unimaginable occurred. Although my vertebrae were fractured, my spirit showed an unexpected strength and impish playfulness. Each one that came to see me, walked away feeling better about the situation and themselves. I realized that my athletic body was not firing on any of it’s spark plugs, but bitterness, anger and the big question “why?” eluded me. The Light that enfolded my being days before, refashioned my inner workings, and refueled me each day with grace. I could not feel my body, but I was aware of the flow of grace that tickled me like a champagne IV. I never for one moment felt abandon by, or separated from, that calm, or that deep love that held me, and “IT” animated me to bestow the gifts on others. My sister and I, and the halo to stabilize my neck. In two weeks the swelling went down along my cord, and the surgery was scheduled. Bone from my hip was used to fuse my vertebrae ~ not create man, and a halo was screwed into my skull to steady my neck. To keep my skin from breaking down, they used a bed called a Stryker Fame. The nurses would put a padded board over me and strapped it, in order to turn me face down to relieve pressure on my back. This Dr. Frankenstein contraption really was painful. Straps went across my face, the only place I had feeling, and when I was flipped they pressed harshly on my chin and forehead. But, my crazy friends and family would lay on the floor for hours, and made me laugh. This is a picture of the Stryker Frame. After ten days of this hellish bed, a nurse informed us about a Spinal Injury Center one mile away. 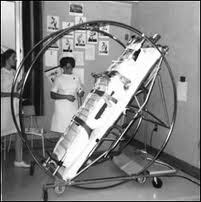 Before long I was transferred to Lucerne Hospital, and the floor was strictly for the rehabilitation of spinal injury. It proved to be bright, cheery, and had updated beds and a fabulous rehab staff. Since everyone on that floor had the same injury, we became supportive to each other, and our families bonded as well. Through it all, I never asked ~ why? I never lost faith of walking again, but the “gift of acceptance” took hold like a baby’s mouth to its mother’s breast. I was feed and nurtured by grace ~ truly amazing grace. This concerned the nurses and physiologist, they worried I had stuffed my anger, and would be troubled deeply at a later date. Along with my daily physical and occupational therapy, my mind was put through an Olympics of tests. Like Archeologists on a dig, they were determined to find the anger, and for me to ask ~ WHY ME? Their eyes saw a motionless body, but they were not privy to the spiritual shift. My body was not functioning, but inside I was blossoming like a flower planted in quality manure. My heart and soul were like chalices brimming with Light and Love, and dissolving effortlessly my fears, anger and bitterness. In place of what they hoped to find was a joyous feeling of unlimited possibilities. Love takes on a new meaning, when one knows ~ we are all one. My heart wanted to embrace everyone who stepped into my room, and it became contagious. What was this new part of me revealing itself with such strength? I began to know it as my spirit, my essence, my soul, my God self. Alone at night I would recall my journey into the realm of perfect peace and Light. The remembrance of All That Is never faded ~ I never felt alone. I could not speak about my attitude, I feared I would not do justice to what was beyond the physical, or no one would believe me. Everyone was perplexed that I was not falling apart, and courageous was the chosen word. But, for me. it did not ring true ~ I felt reborn, not in a religious sense, but born into a life of service to love. About the second month of therapy, my arms regained quite an amount of movement, down to my wrist, but not including them. I felt blessed as I saw others still struggling to breathe. My desire to work hard was unrelenting, and we pushed each other, when our bodies said no. The process was slow, but my family and friends never let me down. Along with their support, I received twenty cards a day as well as beautiful bouquets of flowers. Sometimes, so many flowers, I would wake and think I was in a funeral parlor. 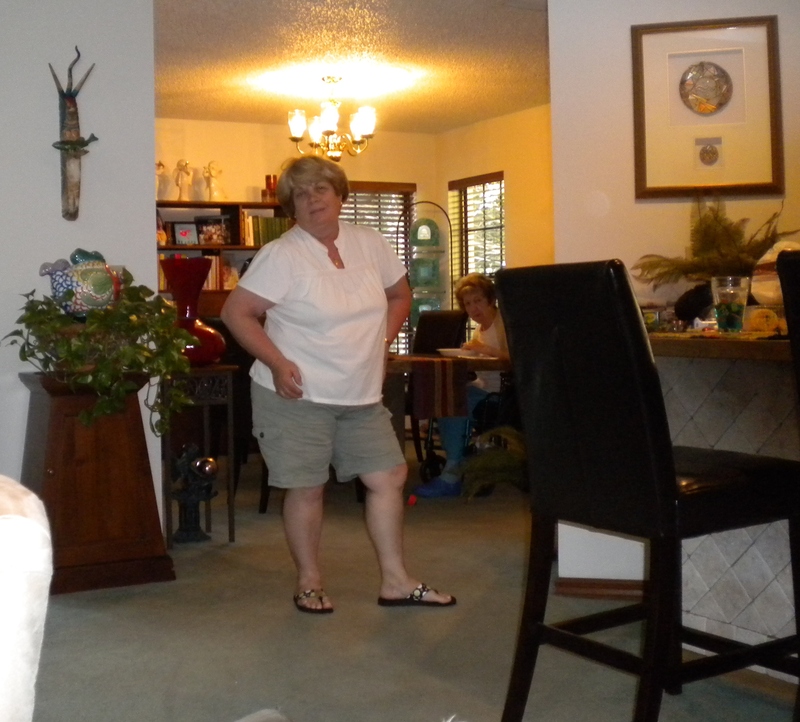 My youngest sister, Nancy, was in charge of being crazy. She manage to entertain the entire floor, along with a whole host of nutty friends and family. My sister, Kathy, sent a comic strip she created every other day, the adventures of Ethel and Evar. They were two well dressed hands, yes hands, that managed to find trouble in each mad capped escapade. They became so popular, that everyone would get excited for mail delivery, and Kathy became a star when she came to visit. My friends were committed to bringing laughter, and we had the hospital in stitches every night with our bizarre sense of humor. My biggest supporters ~ my angels ~ were my mother and father. With unconditional love until the day each one made their transition, they were Gods greatest gift to me, our bonds of love will never die. 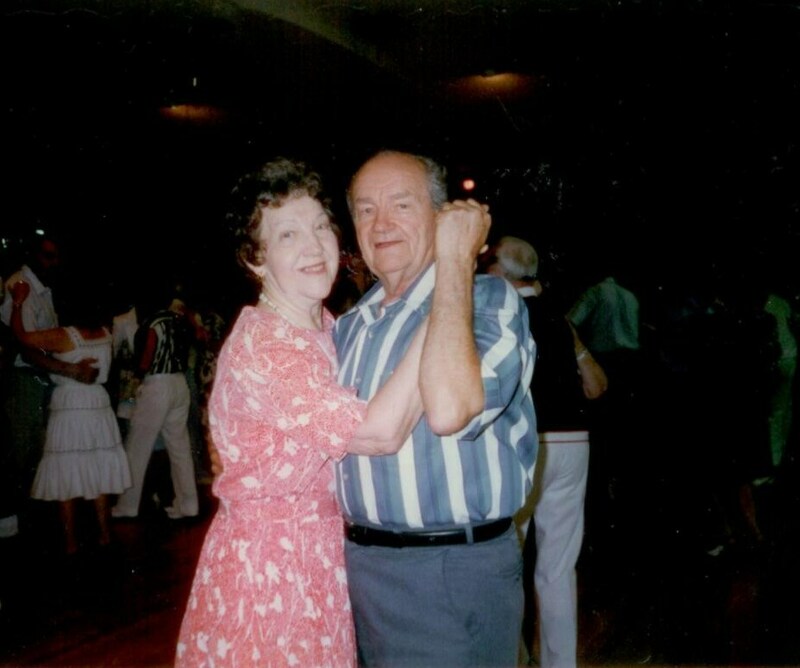 My angels, my mother and father, doing their favorite activity ~ dancing. All toll, I spent seven months in the hospital. The physical therapy was intense, and everyday presented new challenges. Scratching my nose was a feat at first, but I persevered. After months of work, and with the help of a brace, I learned to brush my teeth, feed myself, and I am typing this weekly blog, this day, with the use of my brace. If you add my sporty electric wheelchair, I feel like an independent woman that has been truly blessed. For the last seventeen years, I have been blessed yet again. I have been in the capable hands of Bonni, who lovingly cares for me, putting me together each and every day ~ no easy task. My body wants to age, but my spirit has no clue, it still soars with the flow of grace. The “why” was made absent, when burnt in the fires of love, along with the anger the doctors searched for many years. I would not trade the last thirty four years for anything. It has been, and still is an adventure. And, those of you reading this, facing challenges, do not be afraid to surrender with trust into the hands of All That Is ~God. My blessing with capable loving hands, Bonni.